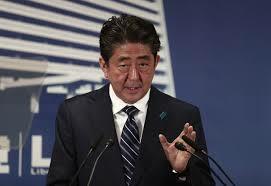 Japan’s Shinzo Abe wins ruling party leadership vote – Royal Times of Nigeria. Prime Minister Shinzo Abe won a ruling party leadership vote on Thursday, setting him on track to become Japan’s longest-serving prime minister and try to cement his legacy, including by revising the pacifist constitution. The 63-year-old conservative secured 553 votes against 254 won by former defence minister Shigeru Ishiba, a hawkish self-confessed “military geek”, in a two-horse race for leader of the Liberal Democratic Party. The win effectively hands Abe three more years as prime minister, giving him the chance of breaking the record for the nation’s longest-serving prime ministership held by Taro Katsura, a revered politician who served three times between 1901 and 1913. If Abe stays in office through November 2019, he will have exceeded the 2,886 days marked by Katsura. Abe insists any changes would merely remove the country’s well-equipped Self-Defence Forces from the constitutional paradox whereby they should not technically exist. “It’s time to stipulate both the Self-Defence Forces and the protection of Japan’s peace and independence in the constitution,” Abe said in his last stump speech in Tokyo. Even if Abe manages to force a revision through parliament, he would face a referendum, raising the prospect of a Brexit-style political meltdown if the people vote against him, said Yu Uchiyama, a political scientist from the University of Tokyo. In addition, surveys show that tinkering with the legal text is far from the top of most Japanese voters’ to-do list, as the country faces an ageing and declining population and a still-sluggish economy.